Sylviane Diouf knows her audience might be skeptical, so to demonstrate the connection between Islam and American blues music, she’ll play two recordings: The Muslim call to prayer (the religious recitation that’s heard from mosques around the world), and “Levee Camp Holler” an early type of blues song that first sprang up in the Mississippi Delta more than 100 years ago. But it’s the song’s melody and note changes that closely parallel one of Islam’s best-known refrains. As in the call to prayer, “Levee Camp Holler” emphasizes words that seem to quiver and shake in the reciter’s vocal chords. Dramatic changes in musical scales punctuate both “Levee Camp Holler” and the call to prayer. A nasal intonation is evident in both. It’s really there because of all the Muslim slaves from West Africa who were taken by force to the United States for three centuries, from the 1600s to the mid-1800s. 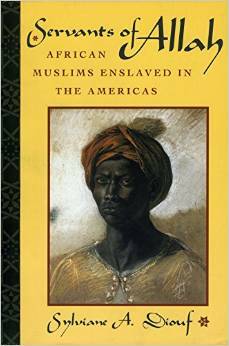 Upward of 30 percent of the African slaves in the United States were Muslim, and an untold number of them spoke and wrote Arabic, historians say now. Despite being pressured by slave owners to adopt Christianity and give up their old ways, many of these slaves continued to practice their religion and customs, or otherwise melded traditions from Africa into their new environment in the antebellum South. Forced to do menial, back-breaking work on plantations, for example, they still managed, throughout their days, to voice a belief in the God of the Quran. These slaves’ practices eventually evolved — decades and decades later, parallel with different singing traditions from Africa — into the shouts and hollers that begat blues music, historians believe. Another way that Muslim slaves had an indirect influence on blues music: the instruments they played. Drumming (which was common among slaves from the Congo and other non-Muslim regions of Africa) was banned by white slave owners, who felt threatened by its ability to let slaves communicate with each other and by the way it inspired large gatherings of slaves. Stringed instruments (which were favored by slaves from Muslim regions of Africa, where there’s a long tradition of musical storytelling) were generally allowed because slave owners considered them akin to European instruments like the violin. So slaves who managed to cobble together a banjo or other instrument (the American banjo originated with African slaves) could play more widely in public. This solo- oriented slave music featured elements of an Arabic-Islamic song style that had been imprinted by centuries of Islam’s presence in West Africa, says Gerhard Kubik, an ethnomusicology professor at the University of Mainz in Germany who has written the most comprehensive book on Africa’s connection to blues music (“Africa and the Blues”). Kubik believes that many of today’s blues singers unconsciously echo these Arabic-Islamic patterns in their music. Using academic language to describe this habit, Kubik writes in “Africa and the Blues” that “the vocal style of many blues singers using melisma, wavy intonation, and so forth is a heritage of that large region of West Africa that had been in contact with the Arabic-Islamic world of the Maghreb since the seventh and eighth centuries.” (Melisma is the use of many notes in one syllable; so, instead of a note that produces, say, a single sound of “ah,” you’d get a note that produces something like, “ah-ahhhh-ahhh-ah-ah.” Wavy intonation refers to a series of notes that veer from major to minor scale and back again, something that’s very common in both blues music and in the Muslim call to prayer. This entry was posted on June 23, 2015 at 12:07 am and is filed under music history. You can follow any responses to this entry through the RSS 2.0 feed. You can leave a response, or trackback from your own site. This is taken from an article by Jonathan Curiel entitled “Muslim Roots, US Blues.” Please credit the author!